Look at this! Can you believe this is soap! The ultamite decident spa day. What a great hostess gift idea, or for someone you love to pamper. The Kingston Soap Company has been specializing in olive oil (Castile) soaps for the past 5 years. The soaps are very gentle on the skin and also moisturizing and long lasting. 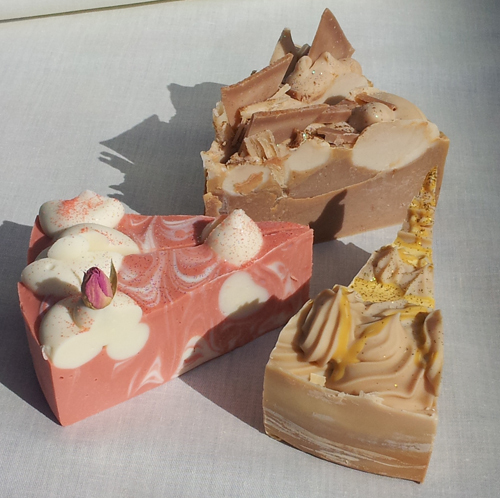 Just in time for Artfest, we have created some new soaps to add to our line – Cake Soaps! Available in Rose Cheesecake, Chocolate Almond Truffle and Frosted Lime Cake. Posted on June 4, 2013 by Lory MacDonald.